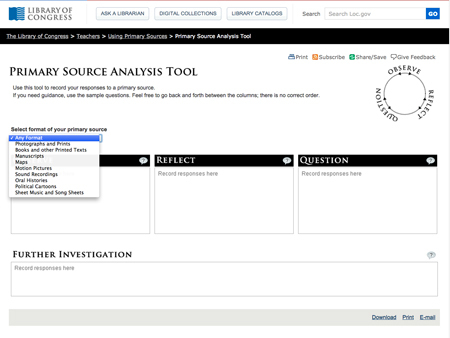 The Library of Congress digital primary source analysis tool is an especially great resource when you want to model a primary source analysis or when you want to complete a class or collaborative primary source analysis. 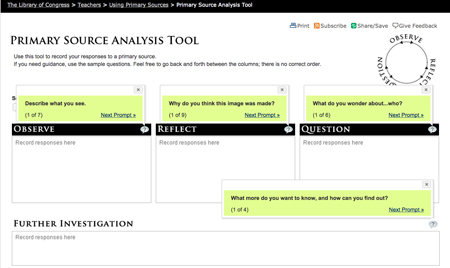 The tool can be used with numerous types of primary source analyses and features prompts for the Observe, Reflect and Question columns as well as the Further Investigation box; the precise number of prompts for each is dependent on the primary source format chosen. 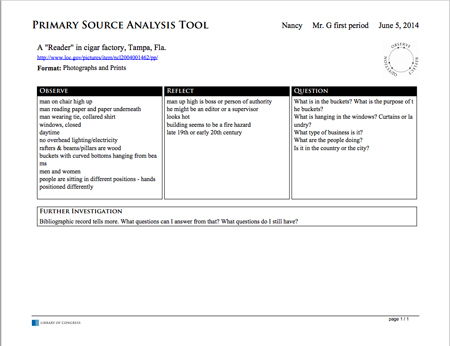 If students have access to computers or tablets, they may also fill out the digital primary source analysis tool individually and print, download or email the completed analysis to the teacher.